INSPIRING BAY: Plow your anger….. | Precious Thoughts! INSPIRING BAY: Plow your anger….. Surprise!Surprise!! [the name of a reality show] where a husband surprised his wife with the help of friends and the reality show’s team. The surprises were: a time away on holiday, her friends appreciated her on the show and sang her favourite song.They chose to surprise their friend and [his]wife because she formed a Military Wives choir, which consisted of women whose husbands are in the military just like her. The aim for the initiation of the choir was for wives to be BUSY while their husbands were away fighting. Yeah, a brilliant idea indeed! The ASUU strike in Nigeria has been on for 5 months now, it is an excruciatingly frustrating period for students, being away from ‘uni’ and not being aware of when we’ll be back because this is not summer break and doesn’t look like it. I’m of the opinion that whatever reasons that are behind this action are not justifiable because the students are the ‘pounded yam in the mortar'[you may choose to disagree with me]. While we pray, hope and wait for a change to take effect, what do we do? We get BUSY. 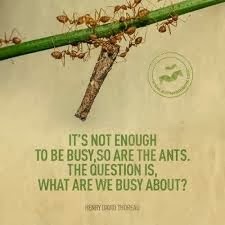 Busy doing anything?NO, not just anything, something enhancing to you and your community/society at large. Our talents and gifts are not given to us in the Universities that we attend, it’s God-given; we have them already, let us discover it, nurture it and make good use of it. WE are very extraordinarily talented, let’s get busy doing something worthwhile. Be it singing?or writing?teaching the kids around us?assisting our parents at their place(s) of work?acquiring some cooking/makeup/fashion designing skills?enrolling in an acting academy?…The list is endless. Or maybe you might not be affected by the strike, it could be that you are searching for a job, getting busy, doing something ‘productive and positive’ is still an ideal venture to consider. There is this popular saying: “Nature abhors vacuum”, this is very true. If we do not consciously fill the vacuum, some other ‘scheme’ will do the honours. P.S Inspire us with whatever activities you have engaged in, to keep yourself busy during this time of strike, and please share the challenges you may have faced also. We love your comments, especially me!!!! Let us plow our anger into something positive..